Serviced holiday apartment, Dartmouth, Devon. Apartments 8 & 9 are our town centre ‘Studio’ apartments, both are ground floor and are each accessed independently from their own front door. Each apartment is essentially 1 open plan space including your living, dining space with a kitchenette which neatly stows away in a cupboard when not in use. A main feature double bed as well as a second auxilly double is located within each apartment. There is separation between the two sleeping areas making these apartments ideal for 2 persons or ready to accommodate up to 4 persons (2 x 2 double beds per apartment) Both apartments offer the same facilities and floor space however each is laid out and decorated uniquely. Each apartment has a spacious shower room with double sized 1200 shower, wash basin and toilet and towel radiator. 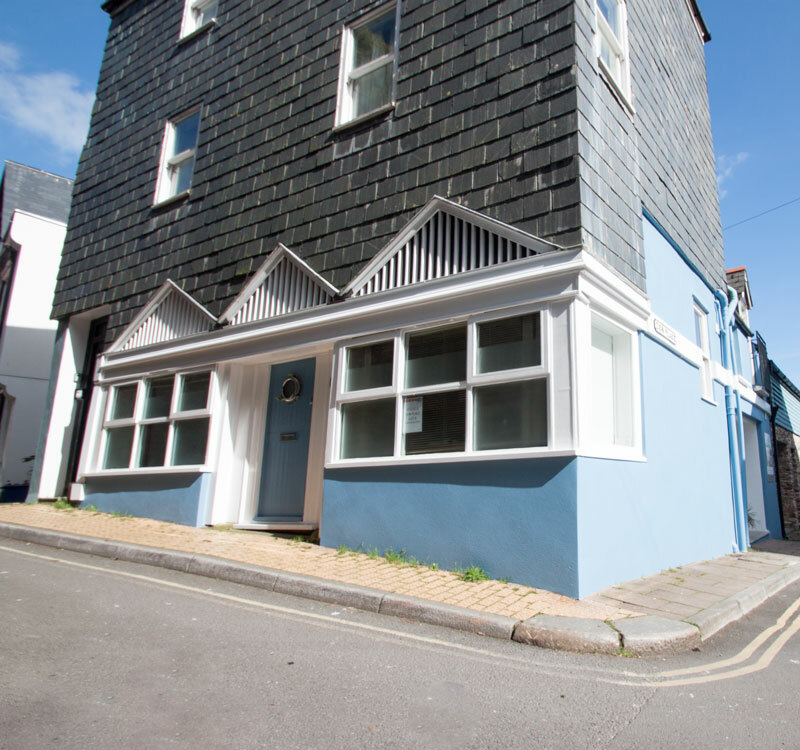 The location of these apartments next door to each other, is incredibly central within Dartmouth town centre and there is lots to explore within a couple of minutes walk. The BRNC naval college gate is just a 10 minute stroll. M&S food hall is just around the corner (literally) if you fancy easy self-catering, the Kitchen isn’t so grand that you feel guilty about eating out! As with all our Just B accommodation in Dartmouth, all linen and towels are provided as well as general basics for your stay. All Just B accommodation in Dartmouth is Room Only and offers Bed no Breakfast in Dartmouth. Enjoy the freedom of having your breakfast at any one of Dartmouth's great Breakfast cafes - there's lots to choose from. Most importantly you can enjoy breakfast and all other meals, wherever and at whatever time you like! Both apartments at Zion Place are Dog friendly. Please get in touch prior to arrival if you would like to include your dog in your stay. An additional fee to cover cleaning will apply and we can send you our guidelines and welcome pack for a Doggy Dartmouth stay!